I’m happy to see these kits available at the North Asheville ACE hardware store near my house. I’m also slightly envious that somebody beat me to it. When I saw them, I instantly had that “hey, I could’ve made and sold those years ago!” thought — which I guess is kinda like when people see a cool piece of art yet say “hey, even *I* could have done that”. Oh well, you snooze, you lose, right? I imagine that these will sell well — easy to assemble, fairly manageable size/weight, and the price isn’t too outrageous. 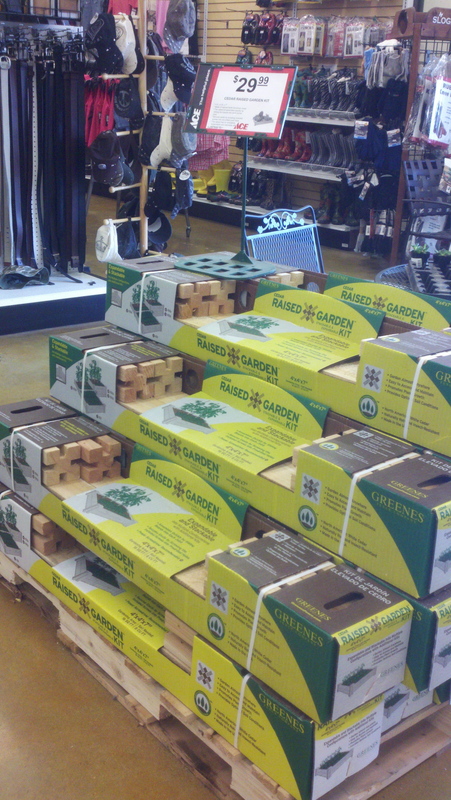 So they’re good for folks who don’t want the DIY experience of building beds from scratch, which can be time-consuming. It eliminates the need to go hunting for cedar lumber and needed hardware, and making all the cuts. The packaging also says they’re “stackable and expandable” so you’re not limited to the size, which is 4 feet square and 7 inches deep. I think that’s a great size for someone who’s starting out with their first garden — but even better, it can grow as you learn. Not only do these kits take the hassles out of building your own beds, they even tell you exactly how much soil you’ll need to fill them: 8 cubic feet. I’m all for anything that gets folks gardening and growing their own food — and I think this is a great idea especially for beginning gardeners and/or people with small yards. Hurray for more yard farmers! !